After a Saturday morning’s visit to the grower’s market with Mr G I came across the Mandagery Creek stand selling their divine farmed venison. I adore venison with its rich gamey flavour. I found it hard to choose from their delectable selection of products including chorizo, merguez, tenderloin but what really caught my eye was the osso bucco. I know some of you are saying....osso bucco....it’s just turned spring! But luckily for me the evenings at my place out in the hills are still a little cold to relish such a divine heartwarming dish. So with a little fresh rosemary, thyme, oranges and parsley, a bottle of Nebbiolo and a little trip to Simon Johnson for some white pearl polenta I was set to create my dinner masterpiece. Just coat your venison in flour. Cook the onion, sweet potato, garlic, thyme and rosemary in a little olive oil until soft. I often use sweet potato in my mirepoix, instead of carrot, as it adds a wonderful sweetness to the final sauce, as well as a little thickening power. Add the red wine and cook it until it reduces to concentrate the flavours then add the stock, tomatoes, bay leaf a little orange rind and ½ cinnamon stick and let it slowly simmer until the venison almost falls of the bone. To make the gremolata just combine chopped parsley, finely chopped garlic, finely grated orange rind, a little olive oil and salt and pepper. 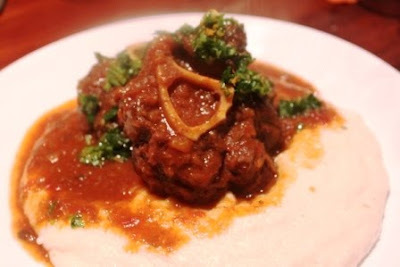 Place the creamy white polenta on plates, top with the osso bucco and plenty of sauce and sprinkle with the gremolata. 1 Place the flour in a resealable plastic bag. Add the venison and shake to coat. Shake off excess flour. Transfer to a plate and set aside. 2 Heat 2 tablespoons oil in a large flameproof casserole dish over medium heat. Add onion, sweet potato, garlic, thyme and rosemary. Cook for 8 minutes or until golden and soft. Transfer to a bowl. 3 Heat the remaining oil in the same pan over medium high heat. Add osso bucco in a single layer. Cook for 5 minutes or until well browned on all sides. Transfer to a plate. Add vegetables and wine. Bring to the boil, scraping the base of the pan. Add stock, tomatoes, orange rind and bay leaf. Bring to the boil, Reduce heat to medium-low. Add venison. Simmer for 1 ½ - 2 hours or until venison is tender. Season with salt and pepper. 4 To make the gremolata, combine parsley, orange rind, garlic and oil in a small bowl. Season with salt and pepper. 5 To make the polenta bring the stock and milk to a boil. Gradually add the polenta in a thin steady stream while stirring constantly. Cook, stirring constantly over medium heat for 10 minutes or until polenta thickens. Stir in the parmesan and olive oil. Divide among serving plates. Top with osso bucco and the gremolata.